I have started my Christmas card early this year. 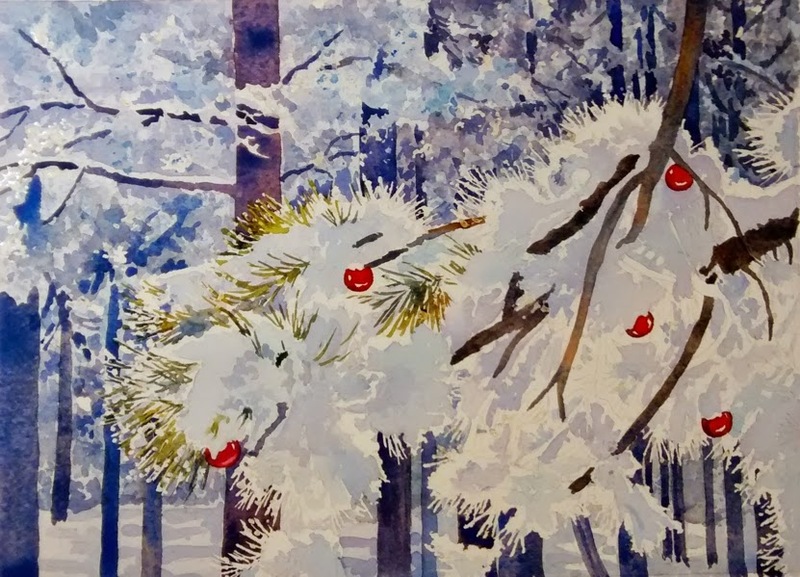 I started creating a winter scene painting for our cards about 11 years ago. This year I am teaching a snow scene class and so I am using the opportunity to create our Christmas card at the same time. I chose to do a painting from a photo that I took after a big snow storm in Colorado Springs. For my Christmas cards, I started adding an ornament or two to make it a little more festive, but still keep the look of a quiet snow scene. 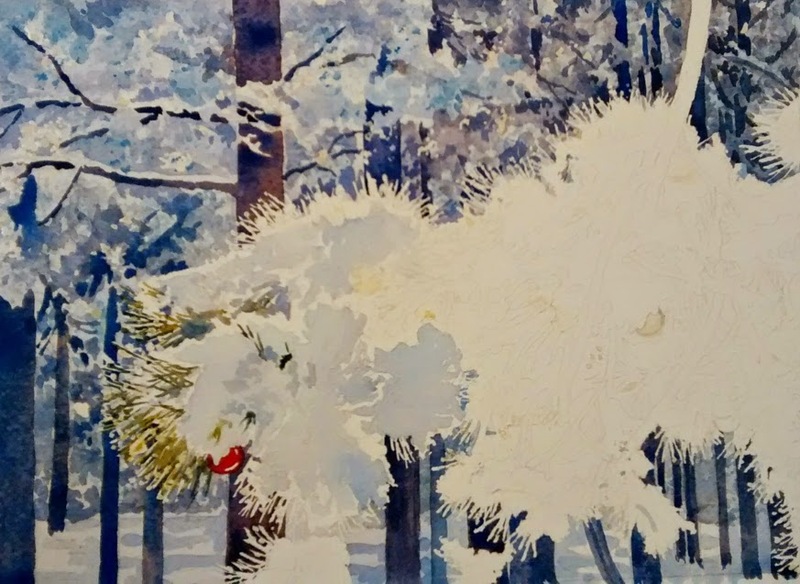 I started the painting by masking off the foreground branches, snow, and pine needles. I also masked off the little dots of white where the ice collected on the ends of the pine needles. I added 5 ornaments to the drawing to make it a Christmas scene. Then I started painting in the background snow and trees. I used some sponging and some direct painting with a brush. I did several layers and changes of value so that there would be depth in the back. After the background snow and trees were to a place that was looking good, I started the foreground branch.The second image shows the progress with the snow shadowed and some of the needles and branches going in. I also painted in the 5 ornaments in red so that they would stand out against the cooler colors. I used a slightly warmer brown and gray brown on the branches so that they would look sunlit and closer than the cooler background trees. I still have some of the masking on the little sparkles of ice snow on the needles. I will continue with the foreground branch and post the final painting when it is complete. Wish I had the ambition and the reference photos to do this...it's a wonderful idea. May I ask what size you work this...do you photograph the finished painting or scan it...and do you print your own cards or have them done by a printer? The red ornaments sure do make it festive! My winter scenes are 8" x 11" before matting and framing. That way, I can scan them in without having to stitch them back together. It is a weird size for framing, though. So, I have to order frames. I do print my own cards. I use Neenah solar white cardstock and envelopes. My printer is an epson 3540 and it uses waterproof ink.